Here is a short bio of Alex. Dr Alexander Mustard trained and worked as a marine biologist, but since 2004 has worked full time as a professional underwater photographer and author. His photographs have won many awards including in the BBC Wildlife Photographer of the Year. His most recent book Reefs Revealed (2007) won the International Grand Prize for the best book of underwater photographs at the World Festival of Underwater Photography in Antibes, France. Alex is the PhotoPro Columnist for BSAC’s DIVE Magazine (UK), a Senior Contributor to Underwater Photography Magazine (UK), a Contributing Editor to Wetpixel Quarterly (USA), and an honorary editor of Ocean Geographic Magazine (Australia). He has written more than 300 published articles about marine life, diving and underwater photography. He is a committee member of the British Society of Underwater Photographers, Associate Editor for Wetpixel.com and a member of the Ocean Artists Society. He has personally presented his work to Her Majesty the Queen Elizabeth and the Duke of Edinburgh. Alex Mustard and Queen Elizabeth. The seabed around Plymouth is littered with bombs and bullets of all kinds. Most are from the Victorian era, but many are from the last two World Wars, and up to the present day. On the morning of the 16th January 1914, the submarine A7 was exercising in Whitsands Bay. She dived to carry out a mock attack on her escorts and failed to resurface. Her crew of eleven officers and men were never seen again. The A7’s sinking was the latest in a long lie of accidents to afflict this class of submarine, and there had been at least fifty eight deaths in the run up to the outbreak of the First World War. The loss of the A7 caused a storm of protest, not only from the general public, but in Parliament as well. Many MPs asked why these ‘Coffin Ships’ were still allowed to operate when they were so obviously obsolete and unfit for duty. The submarine, once seen as an unwanted oddity, was now seen as a threat to the established order, and the Royal Navy made many mistakes as it tried to embrace the huge changes in tactics that were being forced upon it by the looming reality of global warfare. The A7 was one of those mistakes. Although nobody would wish a ship to be wrecked, I am sure that many of us would admit to feelings of excitement and expectation when one does, especially if it happens right on your own doorstep. Jennycliffe has in the past been the scene of many strandings, and of course more recently the Noordzee lay sunk there for over a year before she was eventually salvaged, much to the disappointment of many local divers. However, for ships in trouble, Jennycliffe Bay provides a very sheltered anchorage, and with the violent storms that we seem to be experiencing more often nowadays, it was not long before another damaged ship crept into the shelter of Jennycliffe Bay, capsized and promptly sank. On the night of 21 November 1984 the small cargo vessel Fylrix was on its way from Dean quarry bound for London with a cargo of granite chippings. Whilst off the Eddystone light, some of the cargo shifted and the Fylrix developed a severe list to st’bd; The Master decided to head for the safety of Plymouth, and was escorted into the Sound by a Royal Navy frigate. As the Fylrix approached Jennycliffe the list became much worse and it became obvious to all that the ship would soon sink. In the early hours of the following morning the entire crew abandoned the ship as it started to capsize, and the Fylrix sank in shallow water about one hundred yards offshore. No attempt was made to salvage the vessel and soon she was declared a constructive total loss. The Fylrix now lies on her st’bd side with her stem pointing towards the shore. At high tide she is completely covered, but at low water her port side is completely clear of the water, and you can get on board by simply stepping out of your boat. It is best to be careful, however as just below the surface is a mass of rigging from the radar mast, and it would be very easy to foul your propellor. On a ship this modern, it comes as a surprise to find that all the portholes are made of brass instead of the more usual steel or aluminium. Some of the portholes are hanging open and so it is very easy just to peer into the cabins, although the portholes are too small to enter the ship by. Flyrix ‘The Movie’ Local tele doing a bit on my books. If you want to get right inside, simply go to the bridge and drop right through the door. The toilet is on the left, Captain’s cabin to the right. Of course if you wish to go right inside the Captain’s cabin, or the engine room, then you will have to get properly kitted up as snorkeling inside this wreck is definitely not recommended. So what is it like inside? Well it might sound silly but my over riding thought was how clean and tidy everything was. I kept expecting the crew to arrive back at any moment. In fact the Fylrix is the only wreck that I have been on where you think that you are on the film set of the Marie Celeste. In the Captain’s cabin for instance, all the books were on the shelf, bed still made, and photographs still on the walls, sorry bulk- heads. There was even soap and toilet paper in the loo. It was as if everybody had gone out to lunch. Come to think of it I suppose that is exactly what did happen, only nobody ever came back. Pete Barraclough (presenter with cup) and the film crew. On the outside, the wreck is still completely intact right down to her radar. The granite chippings which caused the capsize in the first place are still left inside the holds, so it is not a good idea to go crawling around inside, as the chippings could quite easily move and cover you. Just off the bridge a lifeboat has broken loose from its davit and is only prevented from shooting to the surface by a restraining wire at the top of the winch unit. Over the rest of the seabed are strewn all kinds of debris. Fire extinguishers, hanks of rope, pieces of wire hawser, broken stanchions, and quite a few pieces of crockery. Judging by the number of divers that swarm over the Fylrix at the weekends, I should not be surprised to find lots of diving knives and the odd mask and snorkle as well. Very soon I should think that anything that can be removed will be, and the only thing of value left will be the beautiful bronze propellor. The Lads from ‘Bovi’ geting ready to blow. If only the Fylrix had gone down on the Tinker reef. What a dive she would have made. As it is you have to contend with hordes of divers banging and chipping away, inflate- abIes churning up the water, and curious board sailors bumping into her upturned hull. It is almost as frustrating as a traffic jam. Never mind, in the evening on a high tide when everyone has gone home, you can pretend that the Fylrix is in a hundred feet of water and puzzle out how to lift that beautiful bronze propeller. Shortly after I took this photo of the Flyrix prop, a very professional ‘team’ snuck down and had it away. Soon the Flyrix started to break up and after a diver was killed in distressing circumstances, he got lost in the wreck and ran out of air, it was descided to blow it up to disperse the wreck and make it less dangerous. Today there is still quite a bit left, but its basically now just scrap. The glory days have gone. 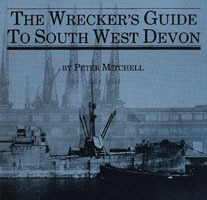 An authoritative insight into the most famous shipwrecks around the UK’s southern coastline, The Wrecker’s Guide To South West Devon Part 1 provides detailed stories and scores of rare archive photographs of the ships that still continue to fascinate scuba divers today. Drawing on his 30 years of experience exploring these shipwrecks firsthand underwater, Peter Mitchell has unearthed previously obscure facts and photos about each ship, how they met their fate and brought to light the stories and lessons they left behind. This book is available in Kindle format. There is currently no print edition available. 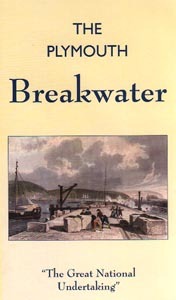 Note: You don’t need an actual Kindle device to read The Plymouth Breakwater – you can read it on your PC, Mac, iPad, and many other devices using the free Kindle software available from Amazon. Simply download the free Kindle software and purchase the Kindle book and you can then read it on your favourite device without needing a Kindle. This video revisits some historic submarines like the A7, the M2, under the sea, and the Holland, the U995 and the William Bauer on land. Whilst putting these submarines in their historical context, it also shows the first operational German submarine U1, and describes Otto Weddinghams famous attack in U9 which by its success virtually invented modern submarine warfare. The film also records a moving visit to the Submariners Memorial at La Boe. 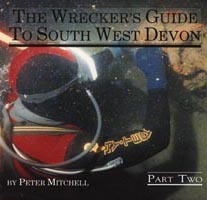 A companion video to the two Wrecker’s Guide books, Devon Shipwrecks offers a wealth of specially shot footage. You can venture underwater and see wrecks like the Nepaul, wrecked on the Shagstone in 1890 which lies only yards from the Glen Strath Allen, deliberately sunk to make an underwater classroom. On March 27th 1943 HMS Dasher, a hastily converted aircraft carrier, mysteriously exploded and sank within eight minutes in the Clyde. Of the 528 men on board, only 149 survived. 379 lives were lost. Of the 379 who perished, only 23 were given an official burial. However many more bodies – either brought ashore or washed up on local beaches and possibly burned beyond recognition, lie in unmarked plots. To this day, no acknowledgement has been made of the number or the whereabouts of these unmarked graves. The lasting and callous secrecy has left hundreds of families not knowing what happened to their sons, brothers, relatives or loved ones and most went to their graves still not knowing. An official Board of Enquiry was hastily convened and within just two days they concluded that the Dasher had sunk due to an internal petrol explosion. However, several key witnesses were not called to give evidence. The official cause of her sinking is still doubtful. It could have been a mine or even possibly sabotage but it could also have been one of the first cases of friendly fire. The findings of the Board of Enquiry were never released until 1972 and even now information is being witheld. This is just part of a veil of secrecy which has surrounded HMS Dasher ever since. Rescuers, survivors and witnesses – everyone with any knowledge of what befell the Dasher in these waters – all were sworn to secrecy. An important new piece of information may explain the Governments reticence to release all of their records. There is a strong possibility that one of the bodies from the Dasher was used in Operation Mincemeat to dupe the Germans about a possible invasion of Greece at a crucial time of the war in 1943. The loss of HMS Dasher and 379 young lives is still not fully understood by those affected. Mystery still surrounds the sinking, the burial graves and the true identity of the Operation Mincemeat body. Perhaps when all the facts have been revealed, they can be finally laid to rest. The scenery along the West Country coast can be stunning, but its real beauty lies concealed beneath the waters of its shallow sparkling bays. Come with us underwater and visit a facinating variety of sea creatures as they go about their busy and sometimes bizarre lives.The cuttle fish for instance is 400 million years old. See them stalk and capture their prey whilst rapidly changing colour. Then marvel at the blonde ray as it flies over the sand and rock inches from the seabed like a low flying cruise missile. Shot entirely on location in the waters around the Westcountry, this DVD will give you an introduction to the vast array of intriguing and colourful marine animals that live just out of site, a few feet underwater in the shallow bays around our coast.